May 24, 2012 • To celebrate the fortieth anniversary of the United States’ Landsat Earth-observing program—which first rocketed into space on July 23, 1972— NASA and the U.S. Geological Survey are giving something special to a few members of the American public. We will create customized Landsat chronicles of changing local landscapes for six U.S. citizens who enter the “American Landscape” contest. To enter, all you have to do is send an e-mail and tell us about the local landscape changes you are interested in where you live and what you hope to learn about them from Landsat’s four-decades of observations from space. We have all seen the world around us change in one way or another: cities and towns growing, forests and fields retreating, rivers and coastlines shifting. Our experiences of living and working where we do give us a very personal sense of how our local landscape has evolved. But to get a clearer and more comprehensive view of the changes going on around us, you would need to observe your local area from high above the ground and for a very long time. That is exactly what NASA and the U.S. Geological Survey have been doing for nearly 40 years with the Landsat program. Simply put, Landsat has changed the way we view our world. In 1972, the value of satellite weather observations had been proven, but the study of land features from space was untried. The Landsat program was our nation’s first step toward studying in a comprehensive way what was happening across the American landscape and around the world. Landsat satellites have documented our planet ever since in great detail, giving us valuable information about Earth’s surface, its ecosystems and the impacts of human activity, natural disasters and climate change. The Landsat program has created the longest continuous global record of the Earth’s surface as seen from space. The images are a critical ingredient in decision making for agriculture, climate research, disaster mitigation, ecosystems, forestry, human health, water management, and more. 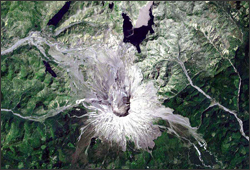 Landsat images are useful to decision makers and scientists because of their scale. You can’t see individual houses in a Landsat image, but you can see large objects such as highways. This level of detail shows things that matter on a human scale, such as cities growing, forests disappearing and recovering, cornfields converted to wheat fields, and even how clear a lake is. The deadline for submissions is Wednesday, June 6.